I am not interested in synchronizing my local clock with the remote server. I only want to query it and print the result. I would have assumed that there is a port of ntpq for Windows, but was unable to find any. All other NTP clients I could find, they always want to install themselves as a service or make it otherwise clear that they want to synchronize my local time. The current time is 19/07/2012 17:39:48 (local time). The current time is 19/07/2012 18:36:32. 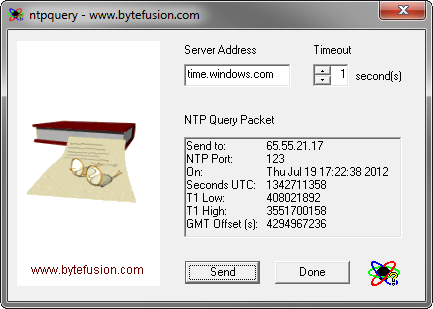 Bytefusion's ntpquery seems to be incredibly old, but works. Sadly, it requires initial installation, but the application files will work fine when copied to another system. Not the answer you're looking for? Browse other questions tagged windows-7 windows ntp or ask your own question. How can I check a system's current NTP configuration? How can I remotely install or uninstall a service on Windows Server 2008 R2? 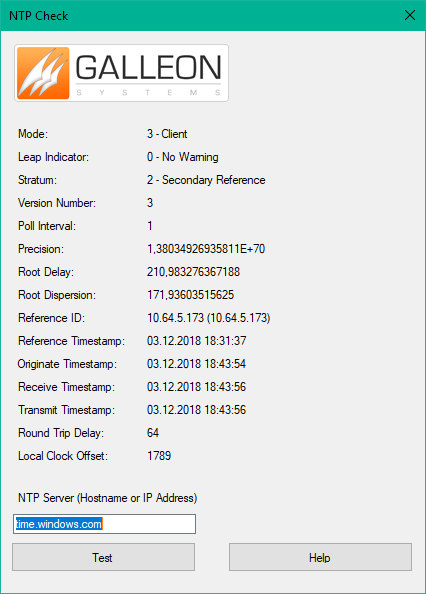 How do I get the current date according to an NTP server without setting it locally? Why ntp settle time too long? How to query a NTP server without root?